Recently, there has been been a lot of conversation around the topic of teacher funding and wages. Taking home an average of $61,420 a year, many people feel as if teachers aren’t getting paid enough; especially in Colorado, where the cost of living is drastically increasing each year. On April 26th and 27th, many schools cancelled their classes due to teacher protests. 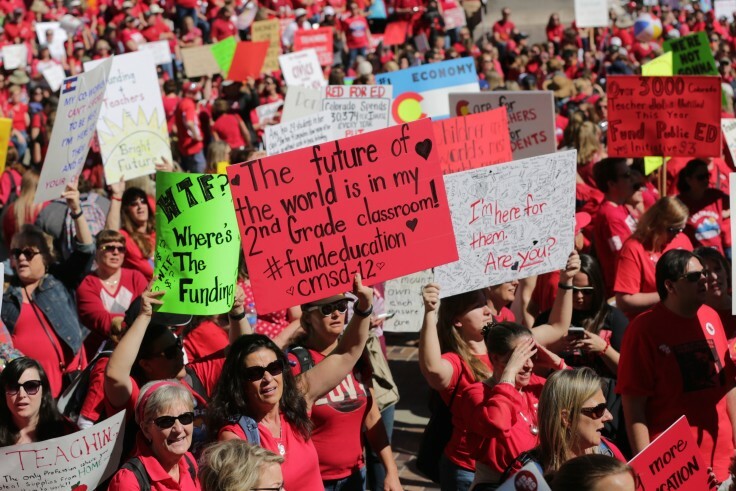 On Friday, April 27th, a sea of red T-shirts worn by teachers, staff, and supporters of Colorado schools marched to the Capitol to protest the insignificant funding given to their schools and students. “Teachers are great writers of signs with wit and insight.” Mr. McClure, an art teacher here at south had said. “The rally was a moment to draw attention to the cause and risks of neglect in education.” For many, feelings of excitement and validation took over the crowd. After the rally, many people believe they will finally be able to see the change they are looking for. “I think it’s a step in the right direction. It will take time but I think that we will see some positive change.” Mr. Schumann says. Although things may not change immediately for teachers and schools around the country, change is beginning to happen.